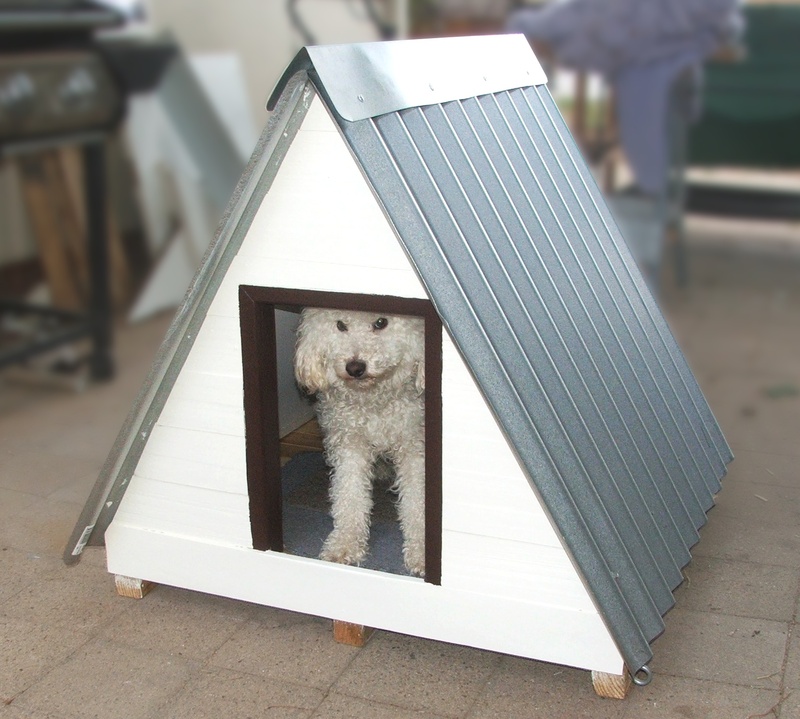 I’ve spent the past 2 weekends building a new dog kennel. We got Loki from the pound just before Xmas last year, he was basically about to be put down when we grabbed him. He’s pretty thin but has really come out of his shell over the past 6-7 months and has a really nice temperament . As the weather has turned much colder now I needed to build him a real kennel to sit in during the day while we are away at work. 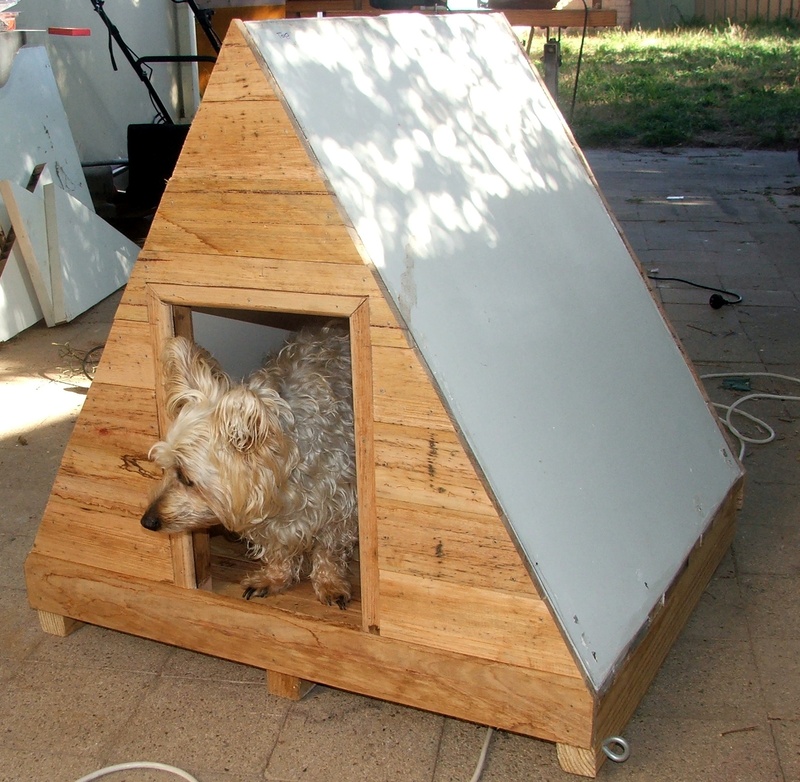 I had some old cupboard doors and bits of timber laying around so designed the kennel around these parts. 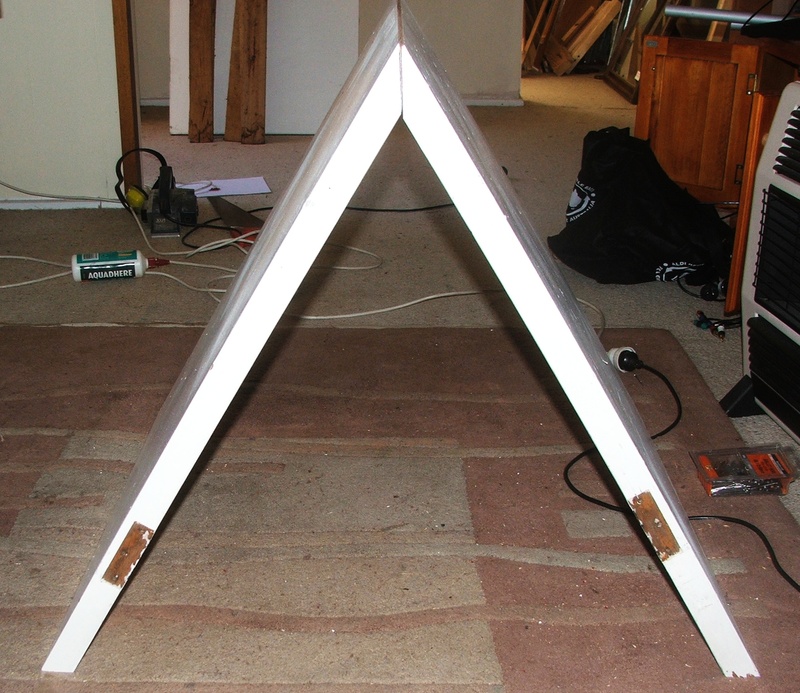 The design I settled on was an A-frame design using the doors as the underlying framework and weather proofing the outside with hardwood and tin to protect the flimsy hollow core door framework. I’m also hoping the air gap in the hollow core doors will provide some very small amount of insulation for the kennel. 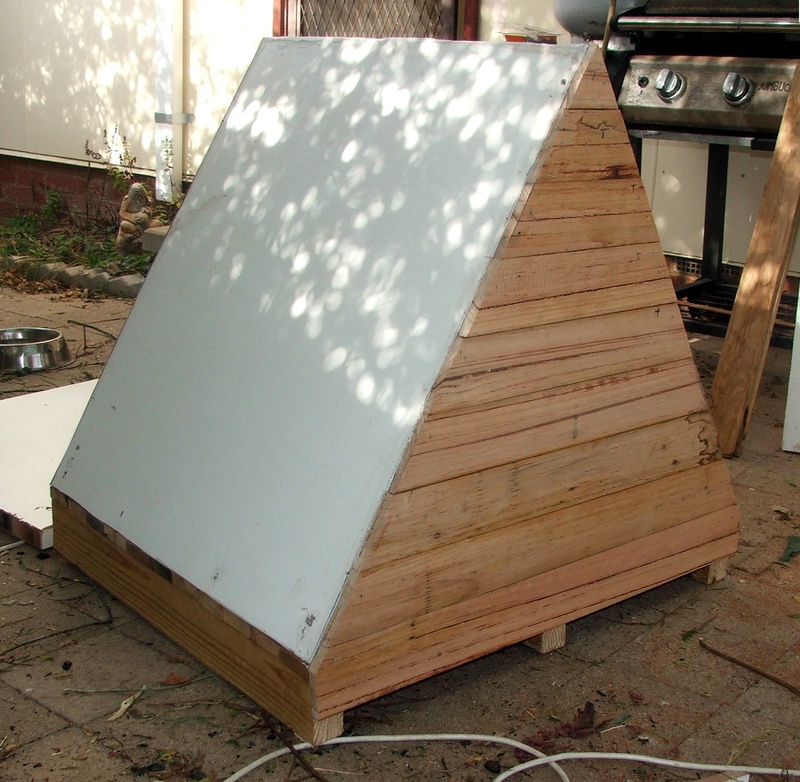 The first step was to build up a solid base using pine slates and pine 3×2’s. 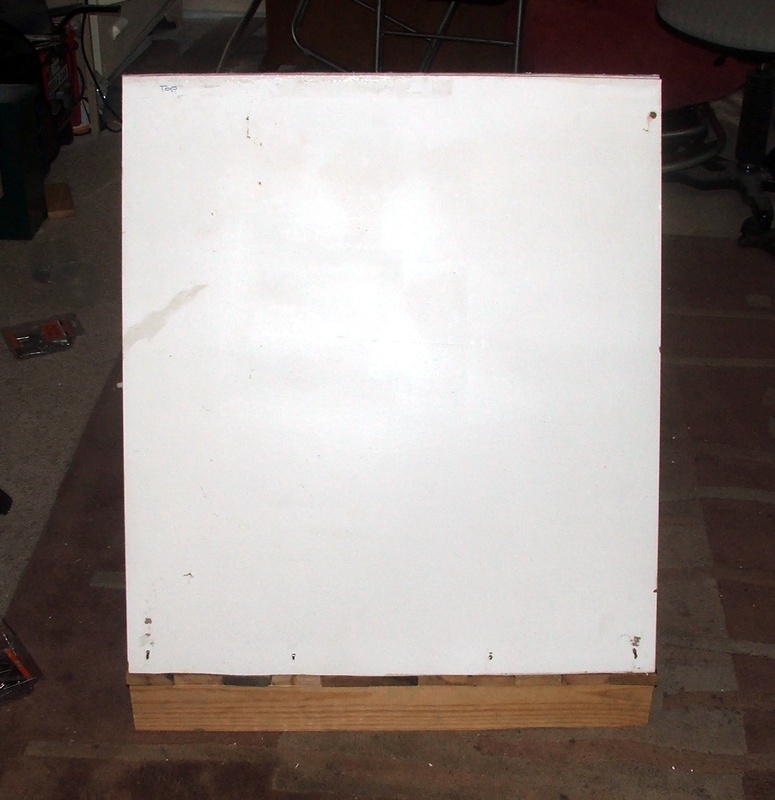 I basically kept it as square as I could but didn’t worry to much about cutting the pine boards to exactly the same length. 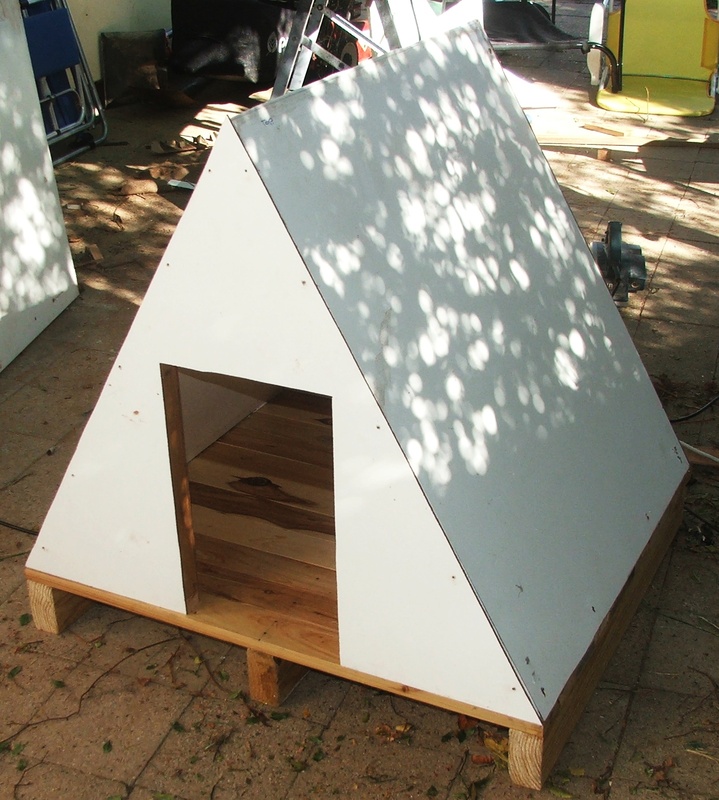 To make my design simpler when looking from the front the kennel would appear to an equilateral triangle. 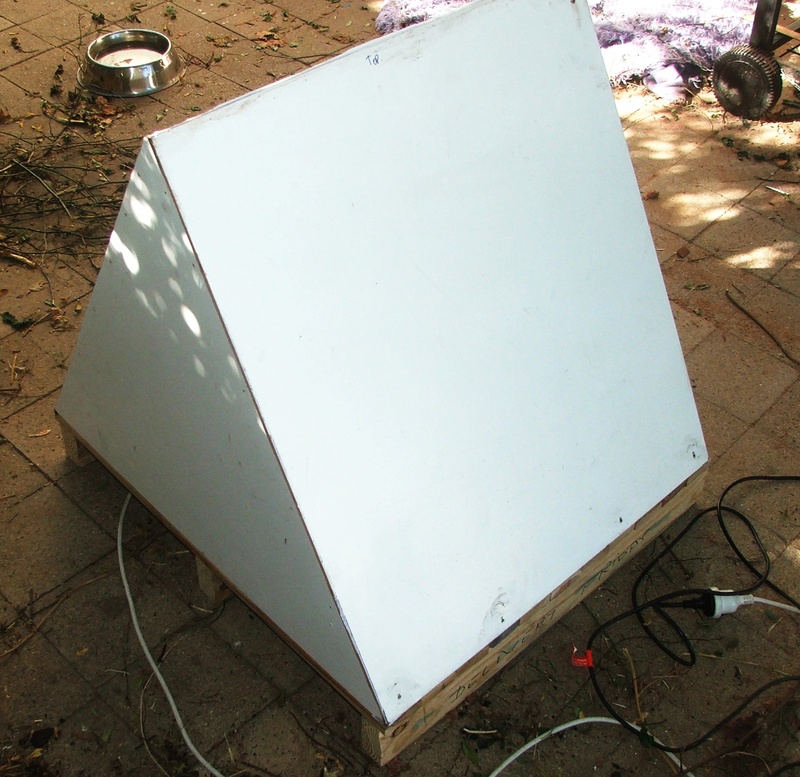 As such the front edge (closest edge in the picy) is approximately 80cm across and the base is just over 72cm deep which was the width of my doors. Next I cut two side walls out of one of the doors. One side was cut from the top of the door and the other side was cut from the bottom of the door. 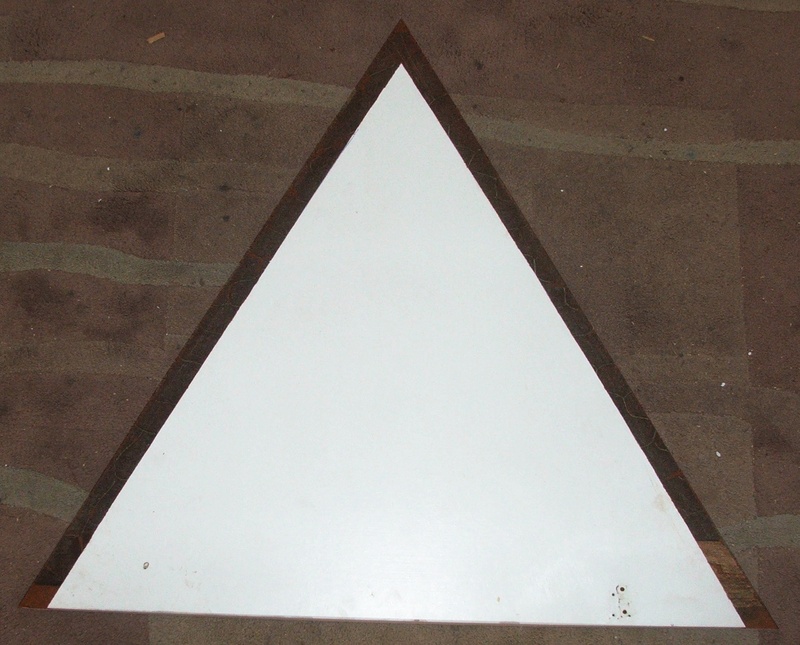 This was so 3 edges of each side had a hardwood rail. I cut the bottom edge of each side to 30 degrees and cut the non-hardwood top side to 60 degrees. 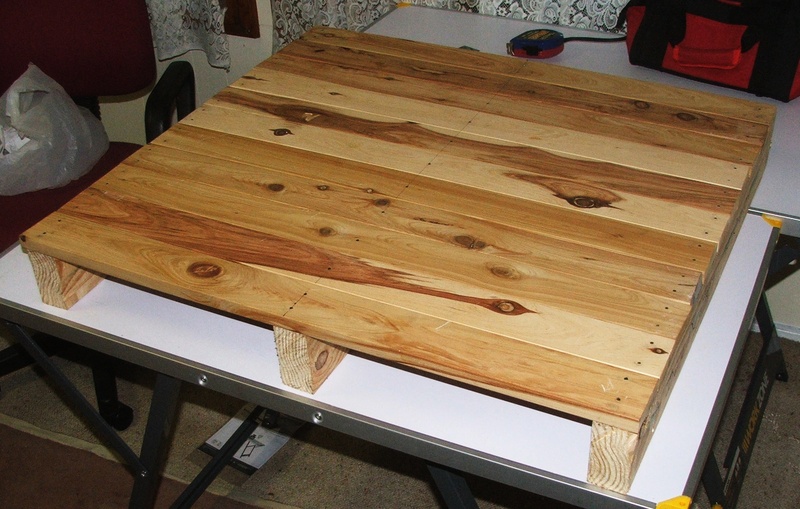 Next step was to simply nail the sides to the base and screw the top together, I only used two screws front and rear at the top and 4 nails along the bottom of each sides edge. All the nails and screws go through hardwood edges inside the doors. Here’s Loki checking out the fit of his new house after the sides had been nailed and screwed on. The second picture shows one of the sides and were the nails and screws are located. I cut the front and rear walls next. 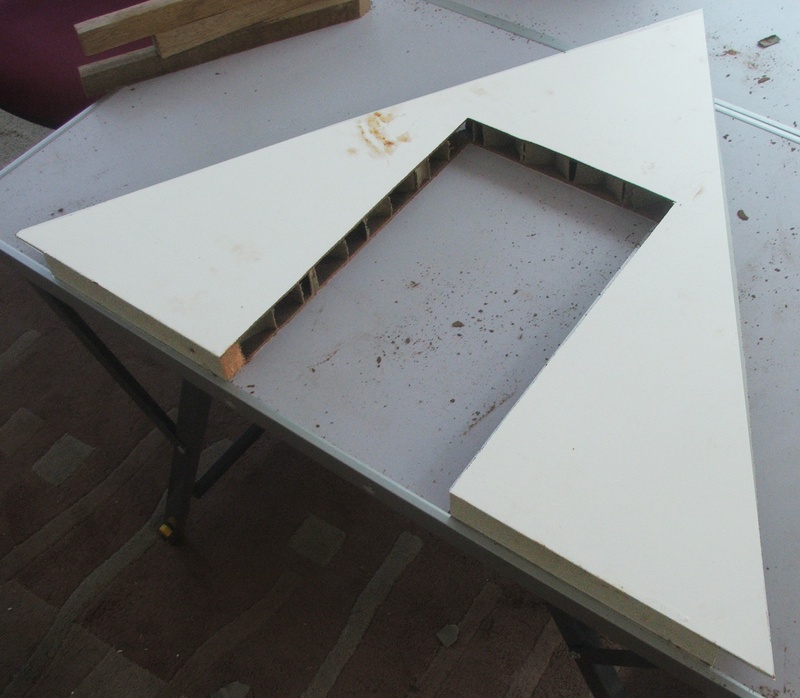 The walls were cut so that they slotted inside the existing frame, however one layer of outer skin was used as an overlap to make nailing and gluing much easier, you can see the overlap in the below pictures. As you can see from the above picture the front wall has a doorway cutout, to fit Loki I had to make doorway quiet tall (15cm) as he’s a tall lanky dog. 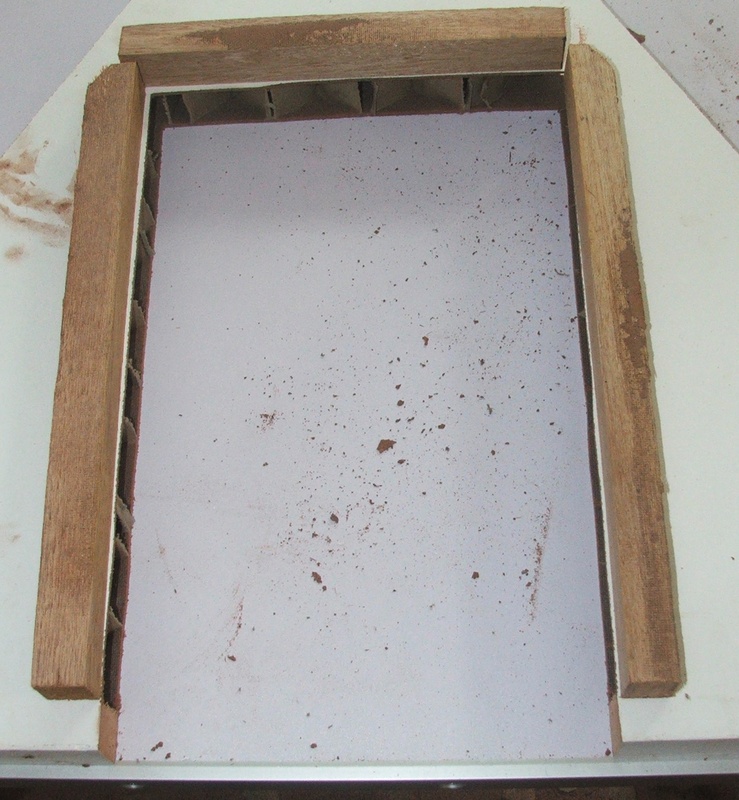 The cutout however exposes the flimsy cardboard inner support structure of the hollow core door. To strength the door hole and protect the inside I cut some small supporting struts to insert into the door between the two skins. I didn’t nail these in place simply glued and clamped them until they were dry. 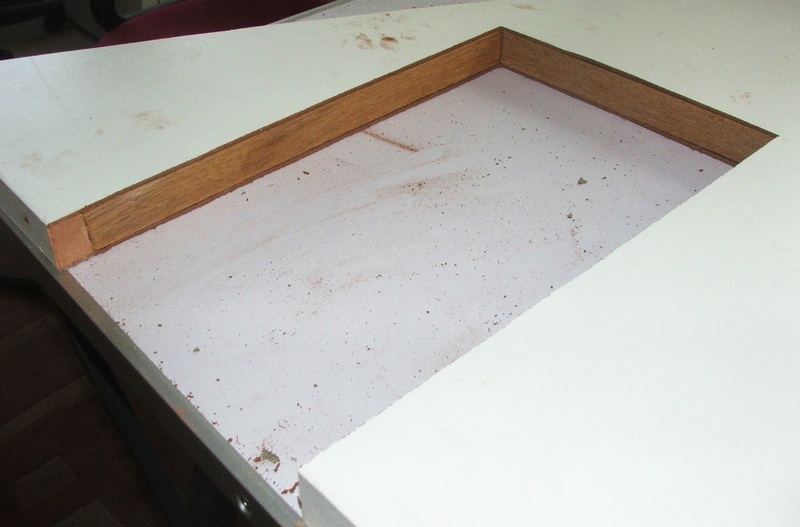 Next it was a simple matter to slide and nail/glue the front and rear walls into place. 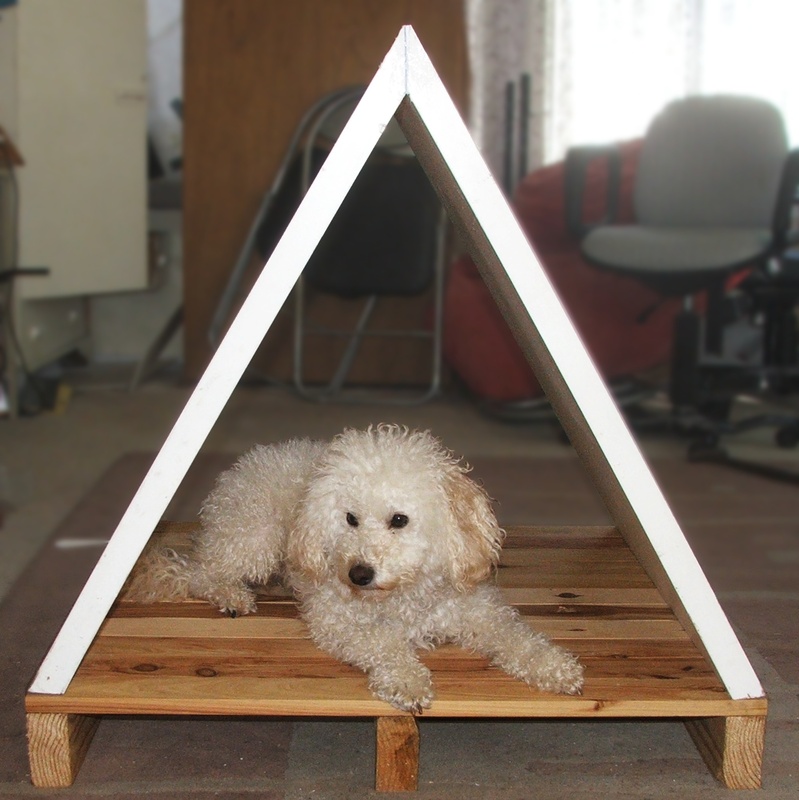 This finished up the underlying framework for the kennel. At this point I ran some silicon sealant along the top edge and in some of the other gaps along the front and rear wall. Not really necessary but just a tiny bit more protection in case some water gets through the tin roof and hardwood boards that were to placed on the front and rear walls. I planed some of the old hardwood fencing planks I had laying around so that what would be the front facing surface had a smoother finish. 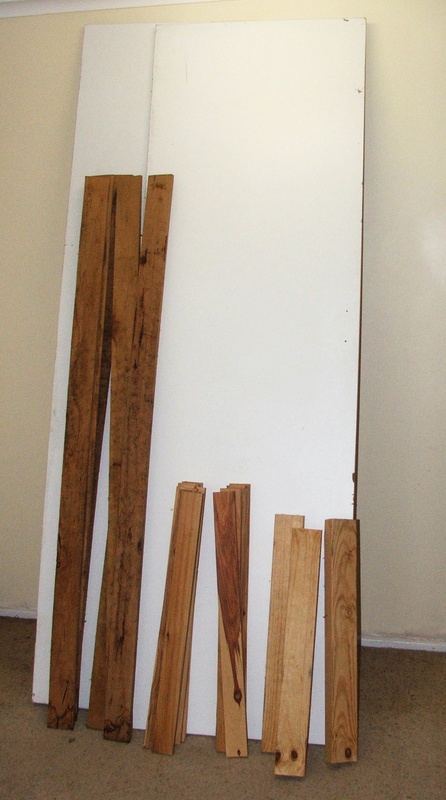 I then cut the planks to length with a 30 degree angle on each end and nailed them in place. Around the doorway on the front side I cut some edging and then boarded around this. It’s a little hard to describe but the photo below should show what I mean. Tory our other dog decided to check the kennel out at this stage. I gave the outside of the kennel a first coat of exterior paint to help provide a little additional protection. 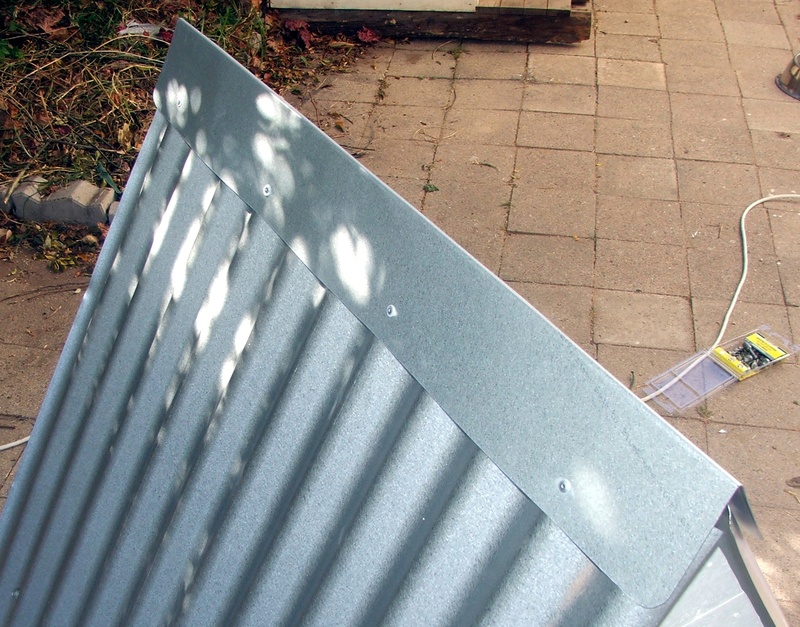 Then I cut two pieces of tin approximately 84cm long for each side and screwed these to the side of the kennel. Unfortunately as I wanted to screw to the hardwood rails in the edge of the door sides I had to screw through the valley’s of the tin instead of the ridges. I’m hoping this wont cause to many problems over time. I used 4 screws along the top which are covered by the tin cap and 4 along the bottom edge which are exposed. Once both bits of tin were fixed to the sides I pop-riveted the cap in place. I dipped each of the pop-rivets in silicon sealant before using them to try and minimize leaks. I used 4 pop-rivets down each side. I had to bend the 90 degree piece of tin to a more 60 degree angle. Unfortunately when I did this I slightly distorted the tin and the cap comes down about 1.5 cm further on one side than the other. It wont affect the weather tightness of the kennel just annoy me :). I rounded off any sharp tin edges so that Loki can’t catch himself on them and cut himself. Lastly I added the few coats of paint to the front and rear. I was going to paint the tin but as it turned out I prefer the tin in it’s natural zinc/tin colour. 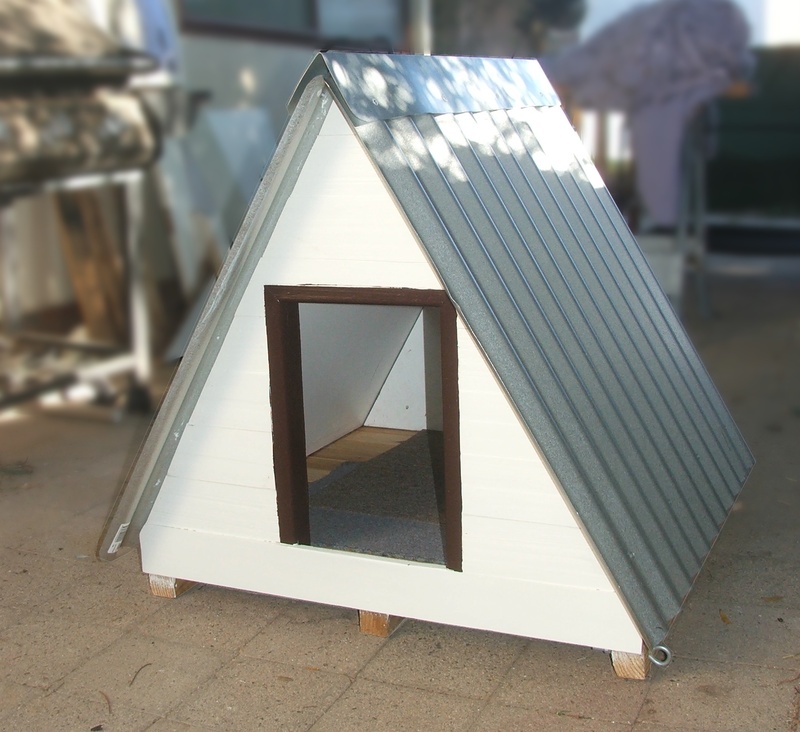 Here’s a couple of pictures of the finished kennel, one with Loki checking out the inside. 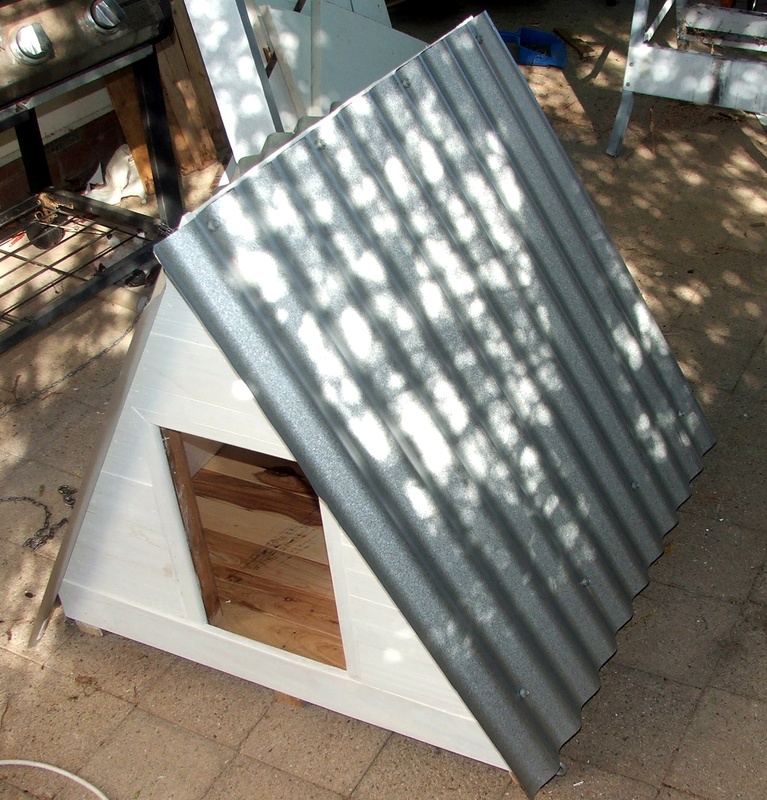 As I managed to scavenge most of the parts up I needed from around the house, the kennel cost me about $50 in materials with most of that being the cost of the exterior paint. It did take me close to 2 days of solid work (across 2 weekends) to finish. I think it was time well spent as Loki will now be warm and dry for the rest of winter :). I’ve been working slowly on my Lego Separatist Droid Army to use against the Clone Army. Here is the first unit an APC. 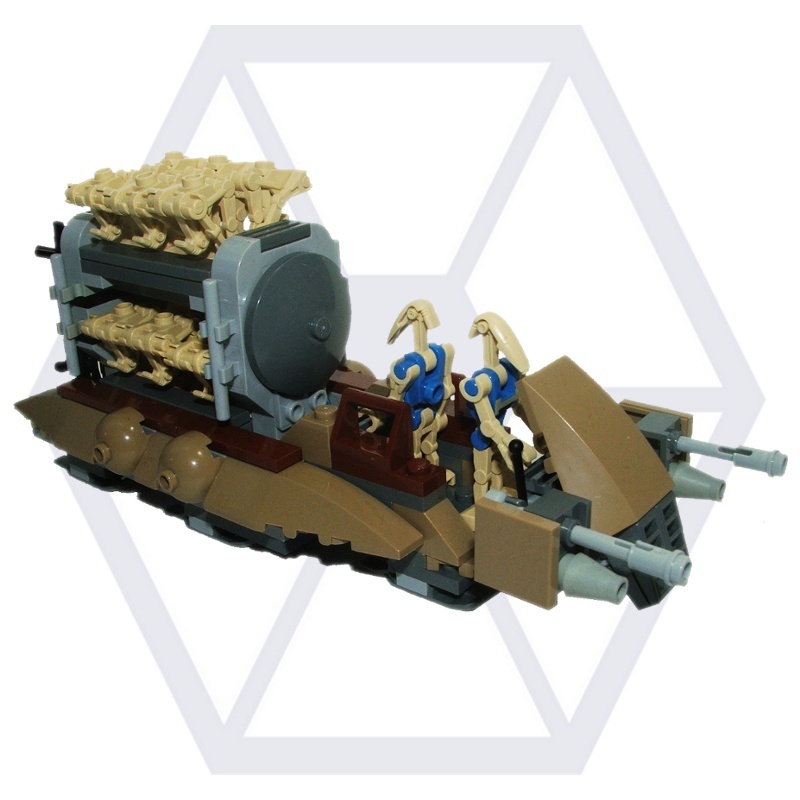 The design is primarily based on Lego set 7929 although that set is the Platoon Attack Craft (PAC) which holds 112 battle droids. This is more battle droids than I could ever use in Defiance as it’s a skirmish based game. The Lego model of the PAC only holds 8 Battle droids, again of little use to me as I’ve created the Separatist army so that it is 12 B1 Battle droids to a unit. I had a hunt around Wookepedia to see if there were any canon Star Wars unit level Separatist Droid transports and unfortunately there are none. Oddly you can either transport 112 battle droids slowly using the PAC /MTT or one at a time quickly on a STAP. Seeing this obvious hole in the Separatist troop transport line up, I’ve designed my own unit based repulsa lift APC/carrier named the Unit Attack Craft (UAC). I stuck with the wonderfully exotic naming regime that the MTT and PAC uses. The UAC was designed by Baktoid Armor Workshop to fill the role as a rapid Battle droid carrier and delivery system. Unlike the lumbering MTT and PAC the UAC is fast moving with a top speed of 250kph enabling it to deliver troops quickly for re-enforcement or for the insertion/extraction of commando droids on a mission . The UAC carries twin linked light laser cannons and twin linked light blaster cannons which are primarily used to clean up any light troop resistance it might encounter on it’s way to it’s destination. The carrier is lightly armoured especially from the sides making it prone to anti vehicle weaponry and light arms fire. The crew consists of a pilot and a loader, both droids however can carry out the others function in case one is destroyed. The UAC can carry 12 B1 Battle Droids and there weaponry, with some re-configuration it can carry 12 B2 Battle Droids or 6 Destroyer Droids. I put together a bit of an action picture/mockup as well, although it’s a little bland. It’s quite difficult to keep the focus on the subject and not clutter up the picture with unnecessary elements. 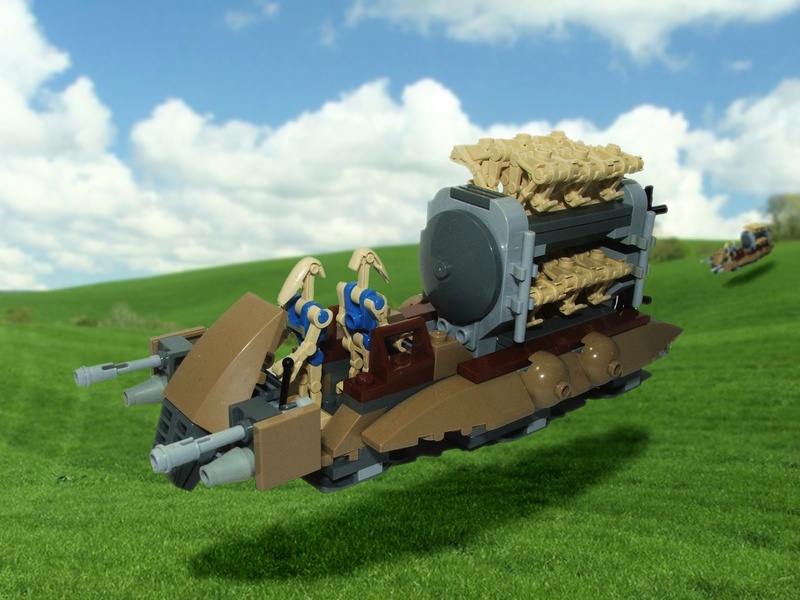 The background of this image was taken by Stuart Brabbs (Rolling Hills and is used under CC 2.0) and represents the rolling grasslands of Naboo with two UAC’s racing to re-enforce a pinned down Battle droid group. I put some instructions together using MLCAD, they are the longest instructions (and largest 4mb download) I’ve ever assembled, however they are only A5 in size and hopefully easy to read. If you do build one don’t worry to much if you don’t have the exact colours needed any kind of black/gray parts should look okay. You can see in my prototype above I didn’t have enough light bluish gray clips for the Blaster racks and used black instead. Have fun and please leave a comment if you build a UAC .